Please note: I’m jumping ahead here, but the long-delayed Part 1 will follow in the next week! 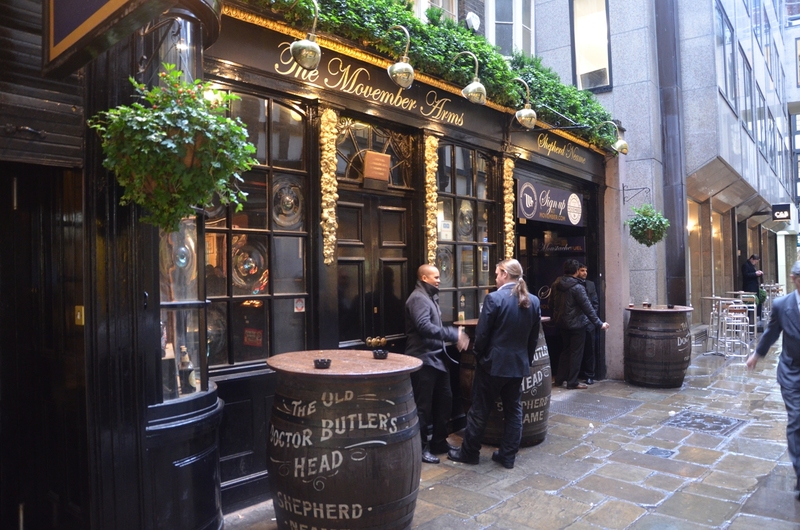 This is the fifth part of my walk following the route of City of London Pubs: A Practical and Historical Guide by Timothy M. Richards and James Stevens Curl. For Richards and Curl, Area 5 was “our largest tour, topographically speaking” – but today, it’s the area which drives home just how much the City has changed in the last forty years. Once, this area was the heart of the City’s brewing industry. 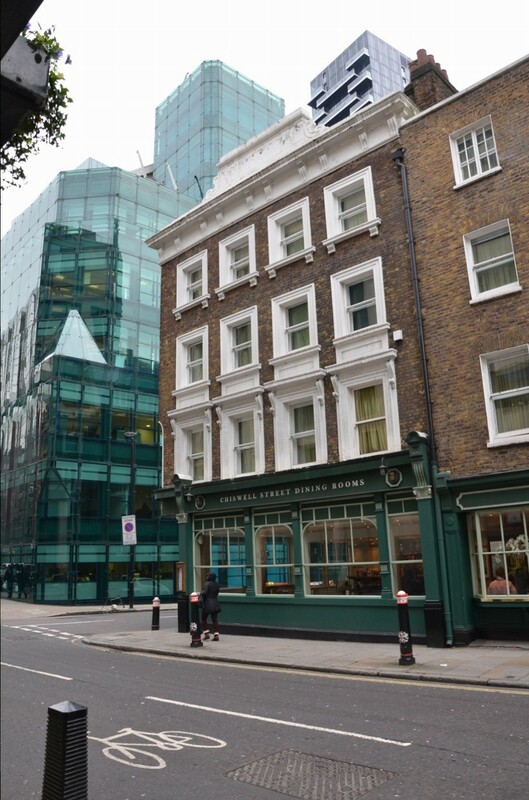 On Chiswell Street stood the Whitbread Brewery, founded by Samuel Whitbread in 1750 as the country’s first purpose-built mass-production brewery. 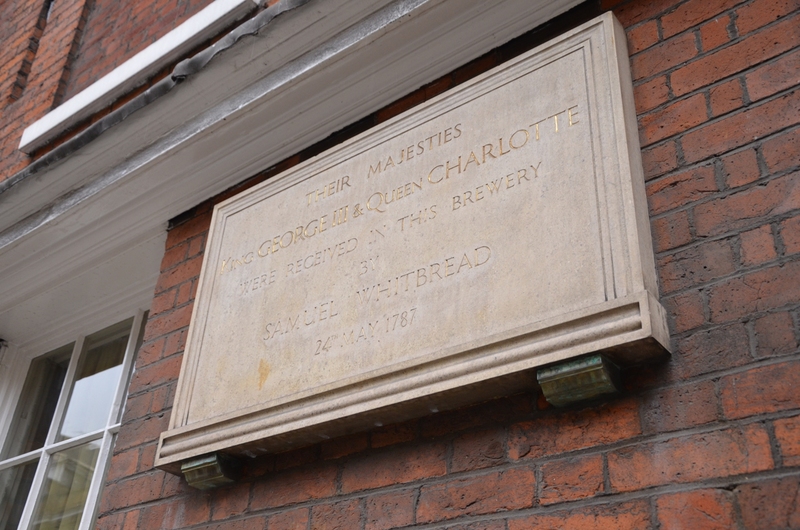 On the wall outside, a stone plaque records a 1787 visit by George III and Queen Charlotte – their visit was commemorated with two rooms used for storing beer named in their honour. The brewery is no longer operating, but it was still a working brewery when Richards and Curl were writing in 1973 – they wrote that Whitbread’s “is now the sole survivor” of the City breweries, which had once been 40 strong – but it closed three years later in 1976. 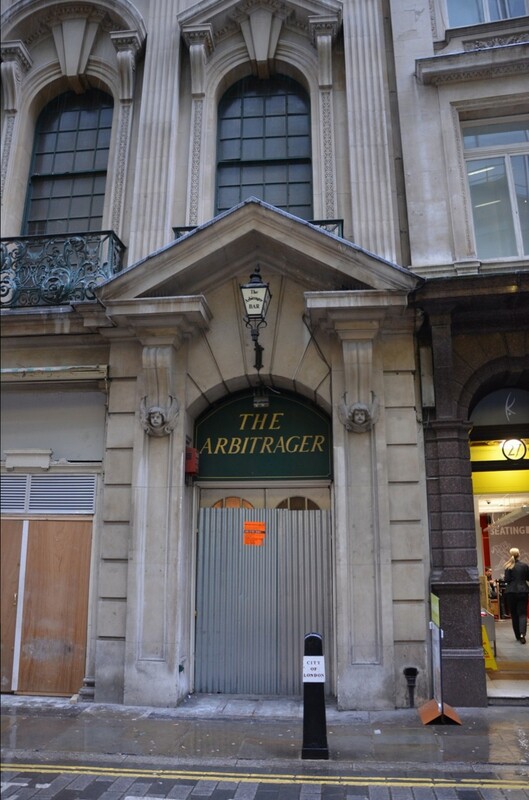 The real damage to the City’s historic pubs started at this point, but it was really during the 1990s and early 2000s that the trade took a hammering it can never recover from. 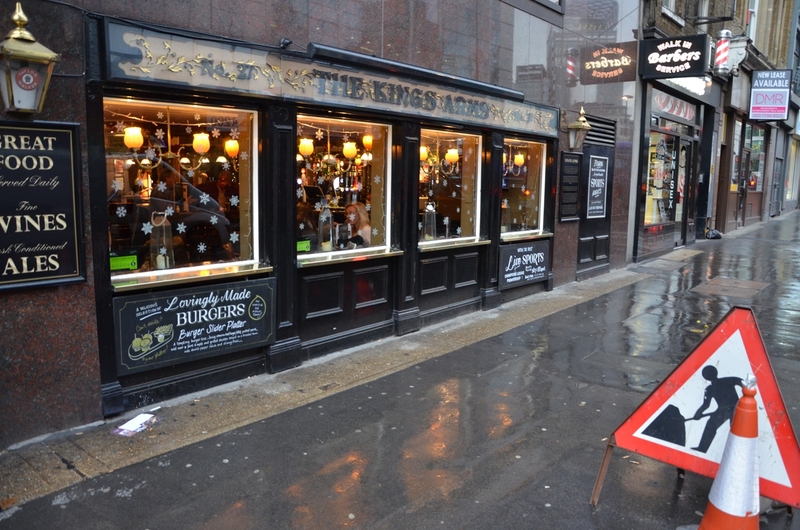 Bigger profits were to be found outside the pubs: in the value of the land and in other, more profitable, businesses. In 2001 we became the company we are today. We sold our breweries [in 2000] and left the pub and bar business [selling off their pubs in 2001], refocusing on the growth areas of hotels and restaurants. Our reinvention as the UK’s leading hospitality business naturally coincided with the ending of this country’s brewing and pub-owning tradition, started by Samuel Whitbread over 250 years earlier. Since 1995, Whitbread have owned the Costa Coffee chain, and this, along with Premier Inn and Brewers Fayre restaurants, has been the main focus of their business ever since. I’ve been there for an awards-do and it’s very pleasant, but I can’t shake the feeling that are lots of other similar corporate venues dotted around the neighbourhood, and it would be far more special if it had remained a working brewery. Of course, that comes down to profit, and if that’s not there, what can you do? 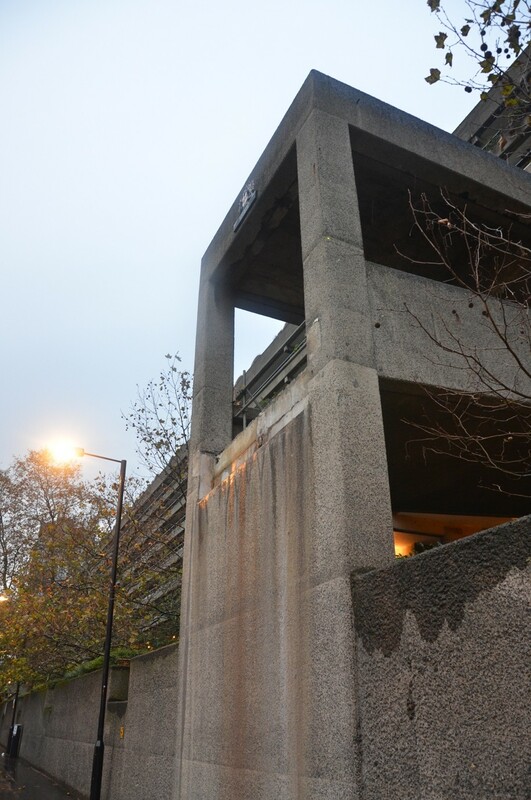 The fate of the Whitbread Brewery was the same as many of the pubs which Richard and Curl visited in 1973, and their writing makes it clear they were largely unaware of the extent of the creeping destruction which was just around the corner. This walk is close to a tipping point in my survey – this is the first walk where the number of lost pubs far exceed the number which have survived. 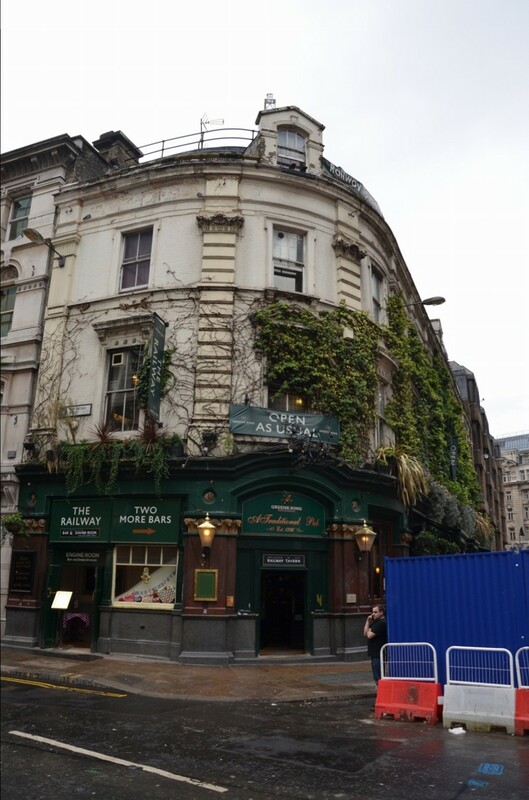 Five pubs that Richards and Curl visited in 1973 are still here; but ten have gone. The City has lost so many pubs by this point in my survey that nearly half of the pubs which Richards and Curl visited in 1973 have disappeared. 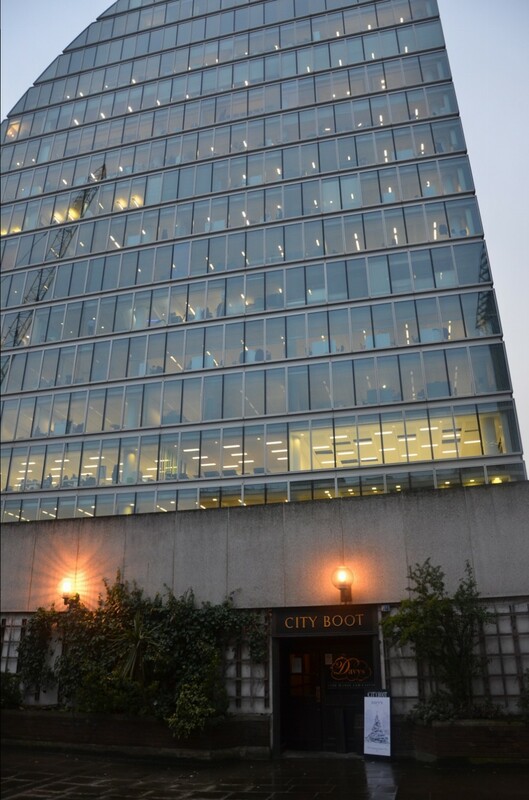 The huge office blocks which now dominate the area have also entirely changed the area’s topography. What used to be a street with numbers neatly along its length has often been replaced with vast glass atriums with company names etched onto the glass, and entire sections of the roads have been replaced by single buildings. Occasionally, this has made it hard to pinpoint the exact locations of lost pubs. 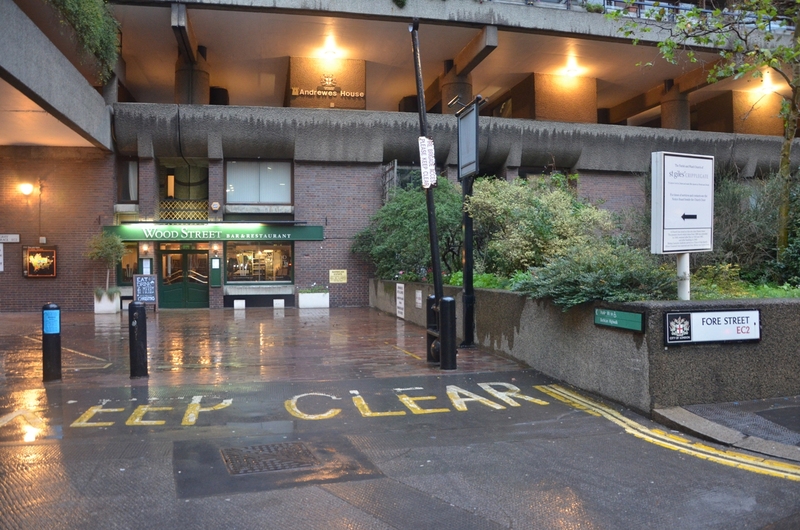 Additionally, there seems to be a concerted effort to hide road names when office blocks have taken over. Many street signs (some of them very old signs themselves) are placed high above the level of the street, often on one side only and at angles that make it almost impossible to see. Why this should be, I have no idea. 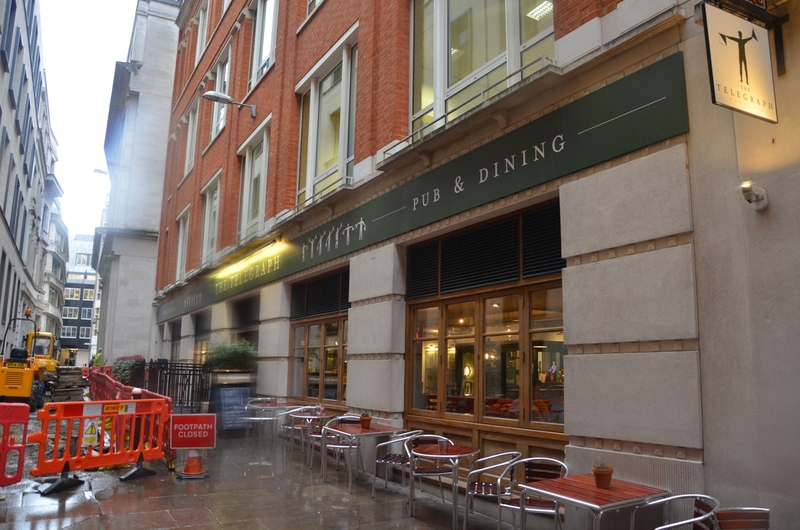 The pub has now gone, replaced with a smart bistro called The Chiswell Street Dining Rooms, which stretches four shop-fronts along the road. There is a bar inside, but it is certainly not a pub – the menu outside sounds delicious, but anywhere offering “prune and Earl Grey tea puree” on the side of a dish is definitely a restaurant. As is often the case when I wander around the City with a camera, a gentleman who worked at the Dining Rooms came over to ask me what I was doing when I was photographing the building. As soon as I’d said “I do a blog”, he immediately relaxed and told me to pop in for a drink if I fancied. I can tell you that isn’t the usual response I get – some people have asked me for “ID proving you’re a historian”, which I don’t think actually exists – so thanks to him. I didn’t have the drink, but I appreciated the gesture. At the junction with Silk Street, on the other side of the Brewery’s entrance from the King’s Head, formerly stood the St Paul’s Tavern, a “popular pub” where “space…is always at a premium.” It has now been renamed the Jugged Hare, and while more obviously a pub than the Chiswell Street Dining Rooms, it is not what anyone could term a boozer. 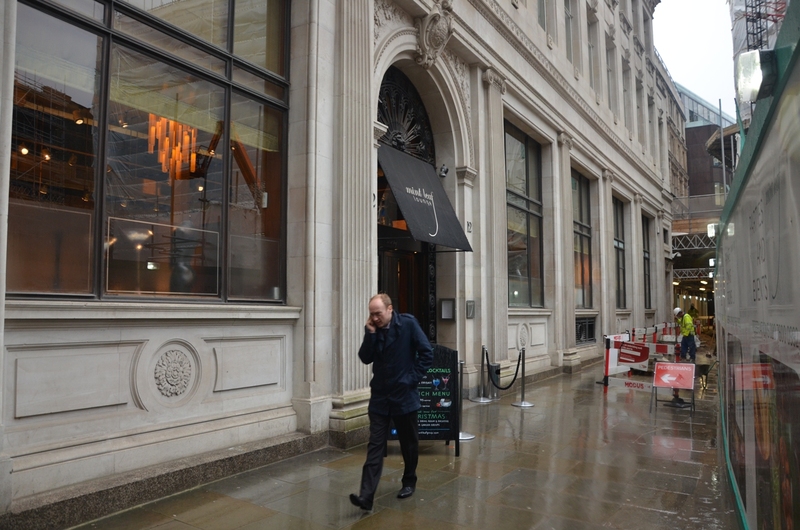 Looking at the menu outside, I noticed the bottom of the menu has the same details as the one outside the Chiswell Street Dining Rooms, noting it was owned by ‘the ETM Group’. 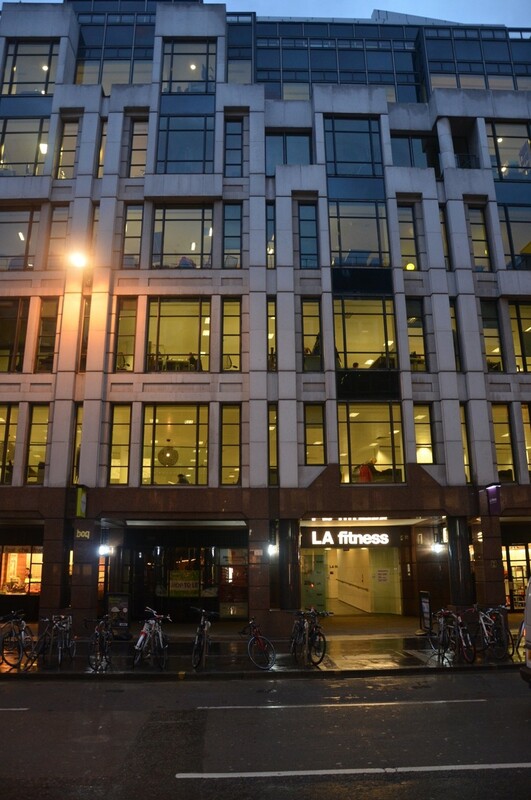 Slightly lower priced than its sister business, it was similarly filled with suited City types and certainly isn’t the sort of place you’d wander into wearing jeans and carrying a copy of the Racing Post. The problem here is that if it looks what a pub traditionally looks like, it has a bar and it serves a decent pint of beer, is it still a pub? I’ve thought about this a lot for the purposes of this survey, and I’ve come to the conclusion that it isn’t necessarily. There are certain things which are integral to pubs that go beyond that – could you pop in for a swift half with two mates on the way to a gig? Could you nip inside to keep out of the rain, and nurse a half for the best part of an hour? Would you go there on a Sunday morning to read the papers? Is the bar the focus of the building as opposed to the restaurant? The answer to all those questions is no. It might seem as if I’m splitting hairs, but I think the main purpose of a pub has to be to primarily serve alcohol to people in a social environment. If the main focus is on food, and not on serving beer, then it’s a restaurant. 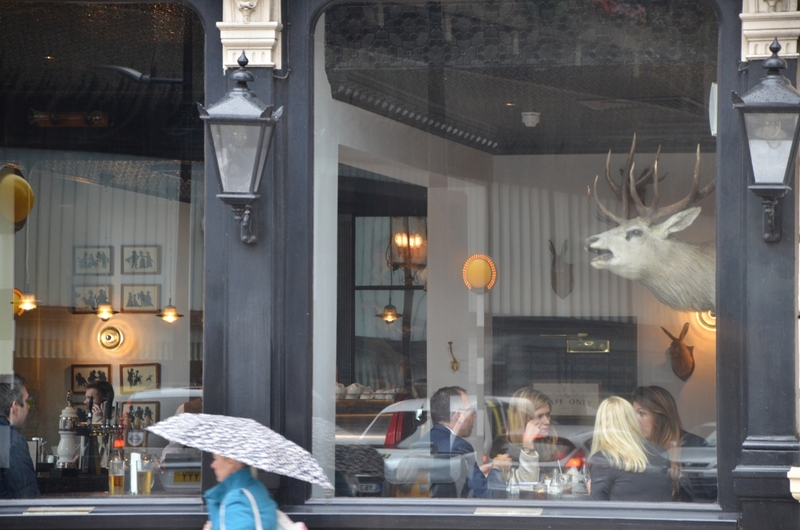 So while the Jugged Hare looked very nice, it’s not any longer what I think can be termed a pub. As Richards and Curl state, the Red Lion (like the two previous businesses) is ever so slightly outside the boundary of the City, but aside from saying its busy, they spend little time on the overall look. Perhaps it’s due to the glass cliffs which now tower above it, but the Red Lion looked terrifically inviting from the outside, and more so when I looked through the door. 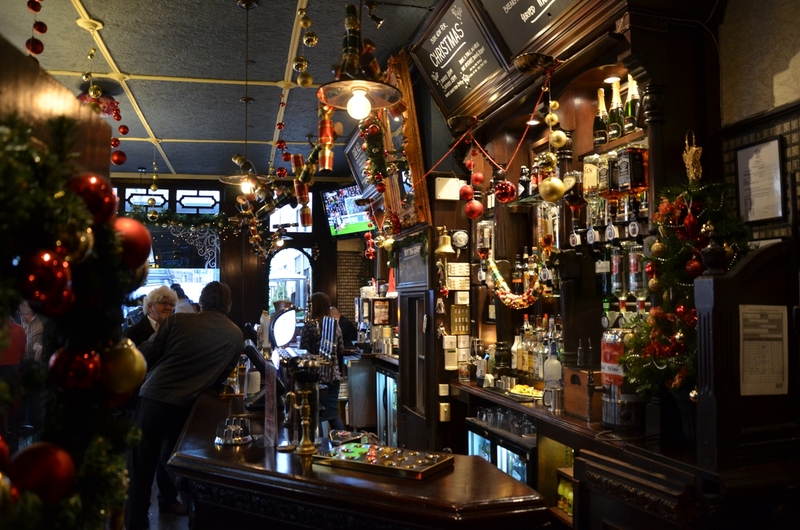 Run by Taylor Walker, it’s a snug, dark wooden room which was full of pre-Christmas afternoon cheer. Not withstanding the handsome sub-classical exterior, the inside is a bit gloomy, with the darkness punctured by the flash of fruit machines, Sky Sports on the flatscreens and an Atom-bomb-bright board on showing rotating adverts for Now That’s What I Call Music compilations and local estate agents. It hadn’t put many people off, as it was busy inside. Next door, the pub’s proximity to the railway was spelled out: Crossrail’s redevelopments are taking place, but it’s a relief to see the pub incorporated into the developer’s idealised vision of the future of the area. “Essentially, as its name suggests,” wrote Richards and Curl in 1973, “Patmac’s (Patrick & Macgregor) is a buffet bar for Liverpool Street Underground Station…It is interesting to note that Liverpool Street should have a buffet bar here, as it is now the only tube station apart from Sloane Square possessing a bar actually on the platform.” While the Liverpool Street tube bar is long gone, Patmac’s is still operating, although now it goes by the much preferable name The Lord Aberconway. 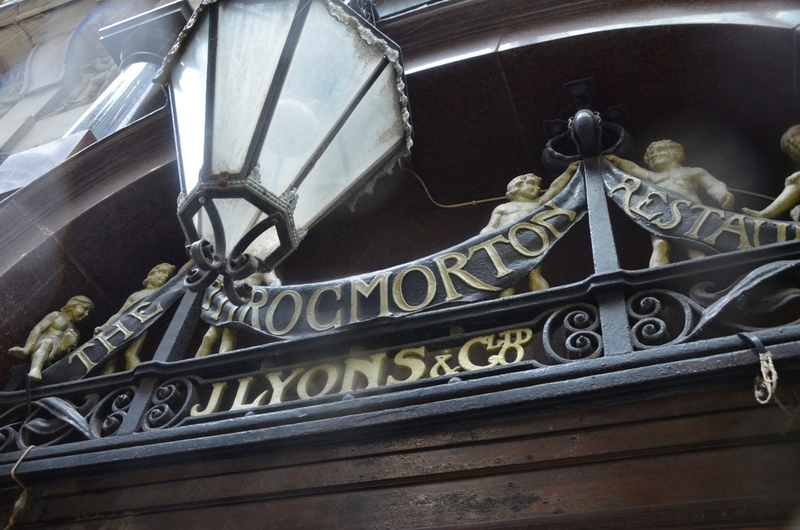 A lovely Victorian bar – probably the most handsome interior of all the pubs on this walk – it’s run by Nicholson’s, who are one of the few brewers to proudly retell the history of their pubs on handsome plaques outside (I award extra bonus points for mentioning ghosts and/or the plague). 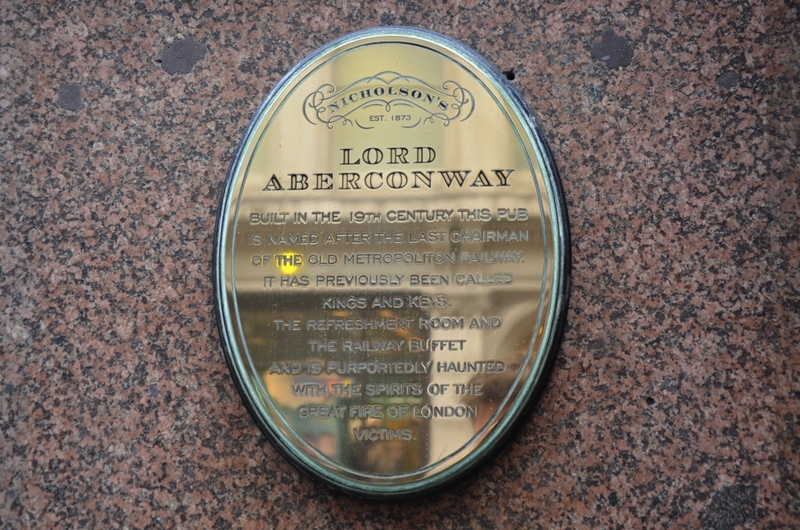 The name change – Lord Aberconway was the last chairman of the Old Metropolitan Railway, which amalgamated with other lines in 1933 to form the Underground as we know it today – is relatively recent, but the pub itself (despite the frequent name-changes) looks as if it has been largely unchanged for years. 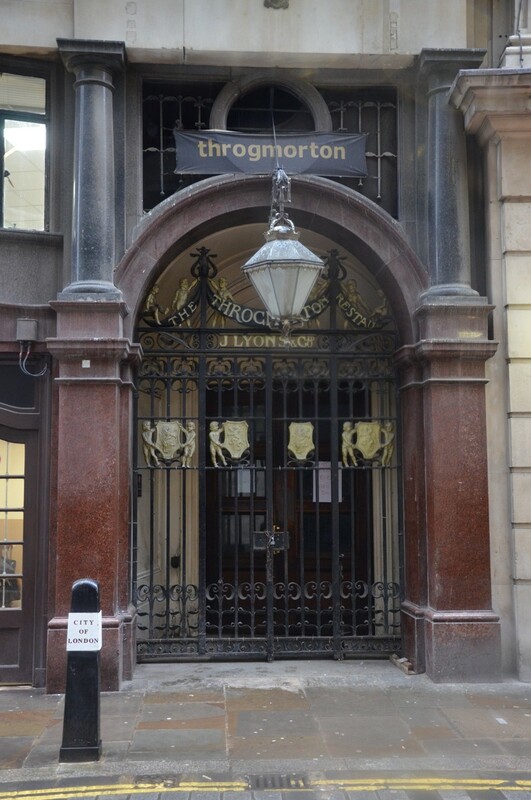 Throgmorton Street was, for many years, dominated by the bars along it, serving the workers in the nearby Stock Exchange. While not doubting Richards and Curl’s appreciation of these places (it sounds a little like the decor of these bars might not be to modern tastes), all have since disappeared over the years as whatever redevelopment is happening in Throgmorton Street continues to not happen. Unlike most City developments, there are no signs promoting any new developments ‘coming soon’, even though it looks as if the road is definitely being prepared for redevelopment. Throgmorton’s closed in 2008, the long-running Throgmorton’s restaurant (responsible for the elaborate metalwork along the road, most of it dating from the time the restaurant was owned by the Lyon’s chain) in 2013, and a pub not mentioned in City of London Pubs called The Arbitager was the last to be operating in the main portion of the road. I went in once a few years back, and it was simply unique – with the racing on, and unpainted walls, it looked more like a Dickensian hole-in-the-wall gin shop than a pub. No less exciting for that. Now it too has gone the way of all the rest. 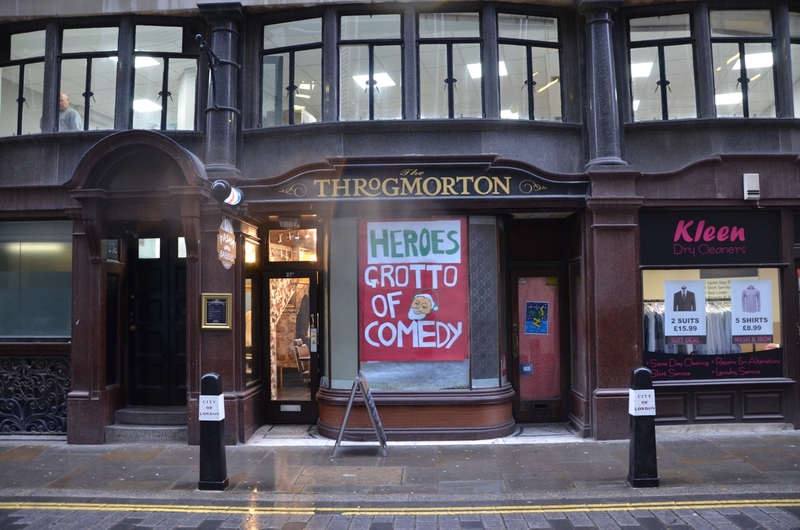 At the lower end of Throgmorton Street, where Moore’s Bar once stood – “below pavement level, the subterranean bars are loaded with Victoriana, especially mirror advertisements of the late nineteenth century, stuffed fish and other period bric-a-brac” – the buildings have all been demolished and are awaiting office blocks. 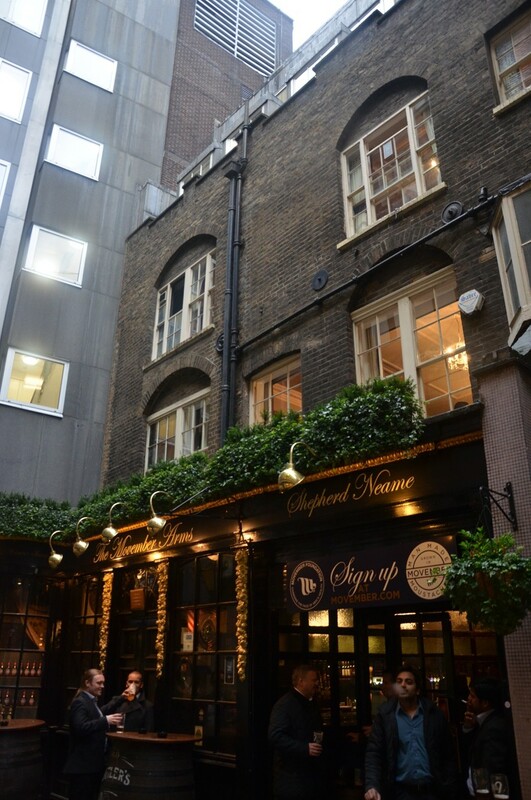 “Chiefly a wine house,” note Richards and Curl, “the shop front, with its three semi-circular leaded windows, is a passable replica of part of the eighteenth-century original [Birch’s wine shop in Cornhill]…the interior is small and intimate, with a board floor. There is a splendid open screen of vaguely Gothick style separating the front bar from the rear alcove containing tables – a most charming feature.” All these features have now gone, along with the historic name – the only business along the street in a building similar to the one Richards and Curl described is the Mint Leaf Lounge, a huge open plan bar which looks a lot of the lobby of an expensive hotel, all honey lighting and strange human-shaped silver statues. 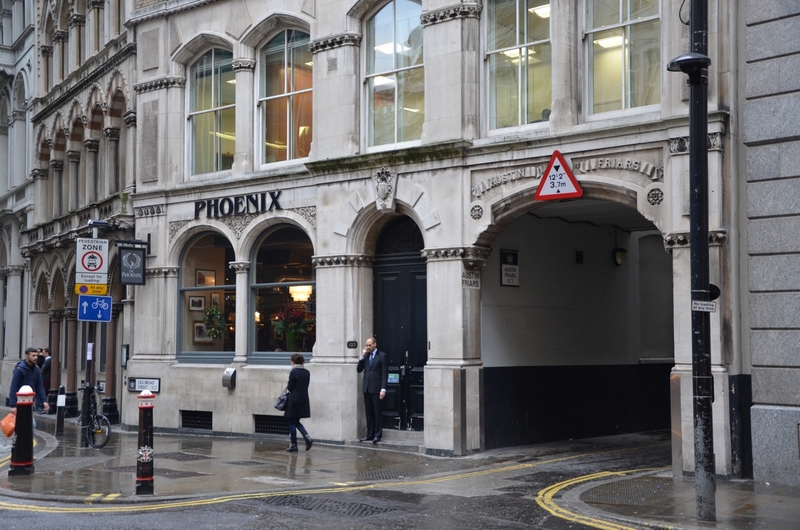 New in 1973 – “another undistinguished addition to the City” – this pub has since been replaced by a later office block with a pub underneath called The Telegraph. 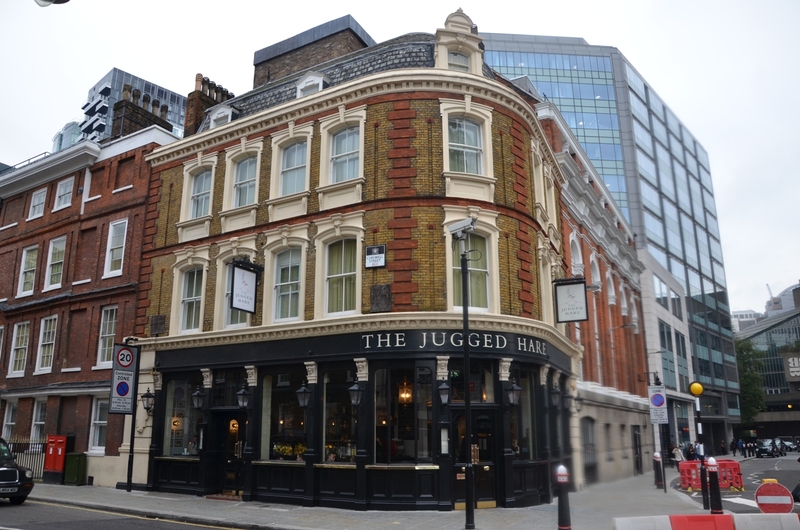 By far the largest of all the pubs I saw on this walk – honestly, you could take the tables and chairs out and play a football match inside – The Telegraph is run by Fullers. It’s newness makes it look like a branch of the Slug and Lettuce and it lacks charm – but I suppose its main purpose is to cater efficiently for large numbers of workers on a weeknight rather than act as a cosy local. Due to the fact that neither Richards nor Curl would recognise this site in the slightest, and the fact the name of the pub which used to be on this site has been lost, I’m counting this as a new pub which has opened on the site of an old one which closed. 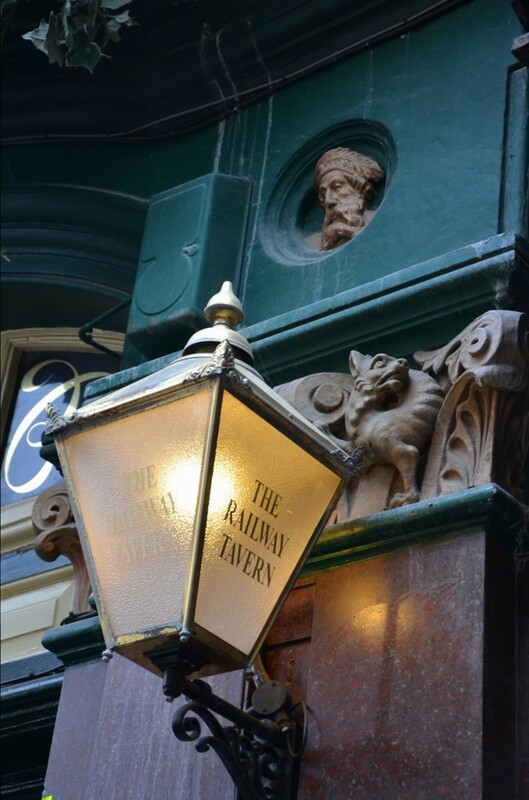 Set in a beautiful avenue of half-timbered, narrow old houses, this pub was named after Dr William Butler, the Court Physician to King James I. Famous for inventing a popular medicinal ale, the pub which takes his name is old, but was significantly remodelled in the 1920s. 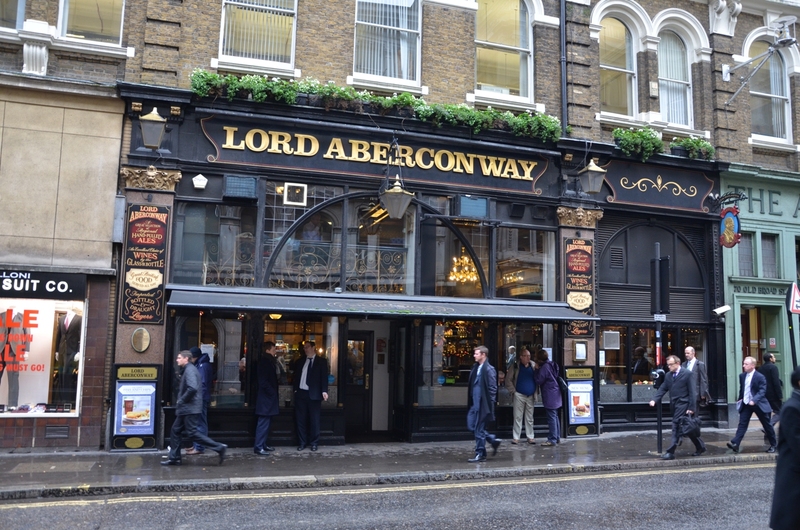 “A late nineteenth-century pub with a strongly designed exterior,” wrote Richards and Curl, “somewhat spoiled by the loss of its original glass.” More than the glass has gone now – the entire pub and surrounding buildings have been demolished and replaced with the ubiquitous office block with shop units underneath. The lack of numbering on this faceless block means its hard to tell exactly where the pub would have been – it looks to be where LA Fitness is. 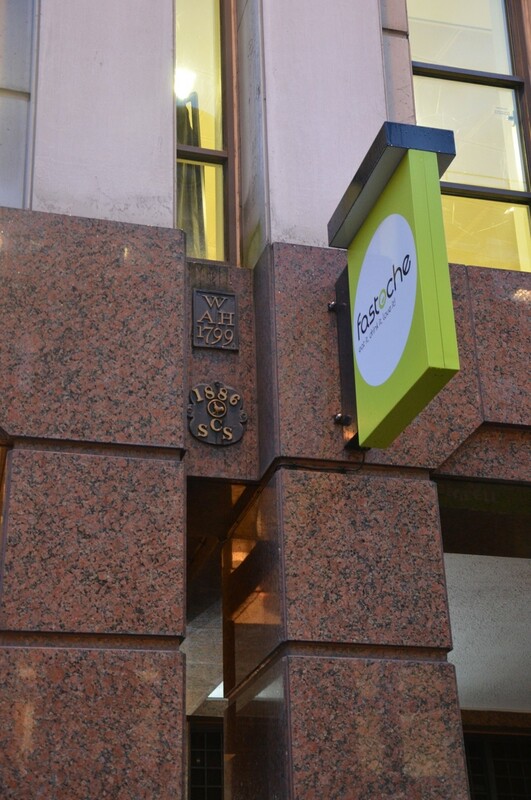 A couple of original metal plaques have been salvaged by the developers and pinned to the front of the modern building like the scalps of defeated enemies – one, which reads ‘SCS 1886’ seems to fit the date of the old pub given by Richards and Curl, with the ‘SCS’ perhaps incorporating the initials of ‘Stirling Castle.’ This is just a guess – if anyone knows any better, please let me know! “The Globe is one of those pubs that no one knows by its real name; it is universally known as The 199.” While I don’t think anyone knows the pub as The 199 these days, the Globe is still standing, huddled together at the edge of a small group of old buildings kept standing as all the surrounding ones have been knocked down to build offices. Huddled together amidst the skyscrapers, the Globe is a hardy survivor –“it was mentioned in 1734 in records of the Clockmaker’s Company, and we know that John Wilkes ‘dined at Globe near Moorgate’ in 1770.” Nowadays there don’t seem to be many radicals coming through the doors, only City workers having a couple of pints before heading to Moorgate station just a few wobbly steps away. 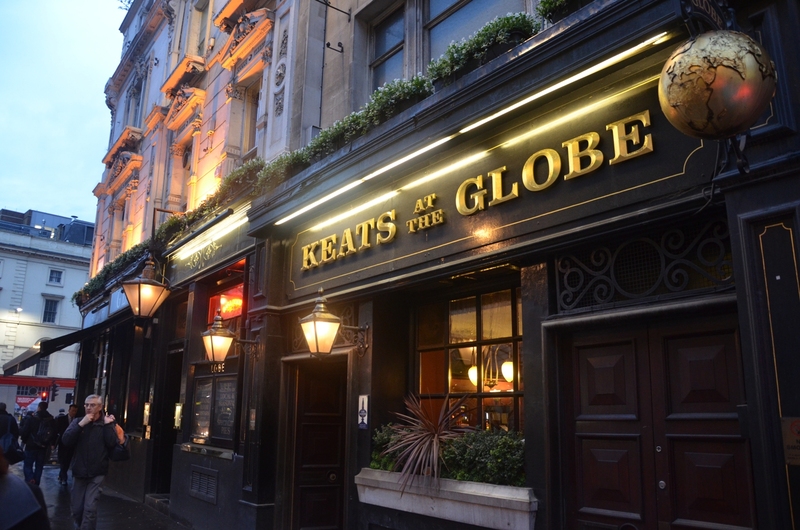 The Moorgate is no longer running, having been swallowed by its neighbour at some point and renamed ‘Keats at the Globe’, although I’m not entirely certain if they are actually connected as a whole. 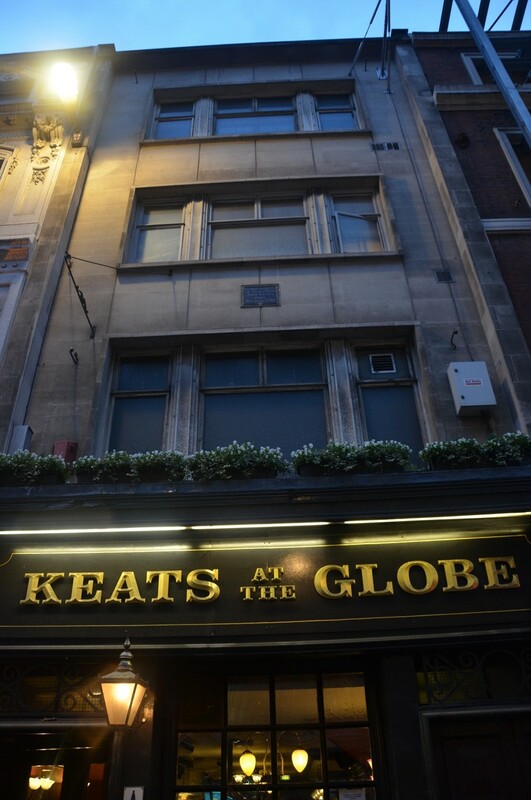 The house bears a plaque commemorating Keats’ birth and the house – not original to the time Keats was born and now looking really tired –probably has its famous connection to thank for escaping the redevelopment which has started one door down. 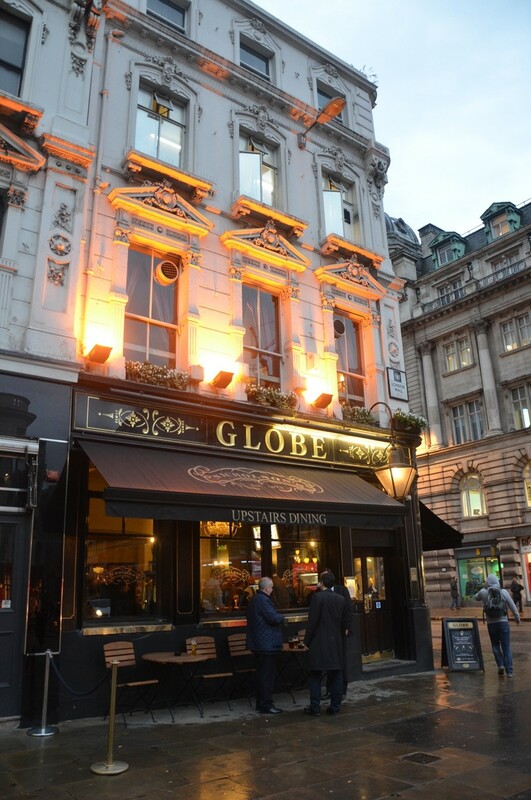 As the pub is now just an overspill of The Globe, I am counting it as lost. 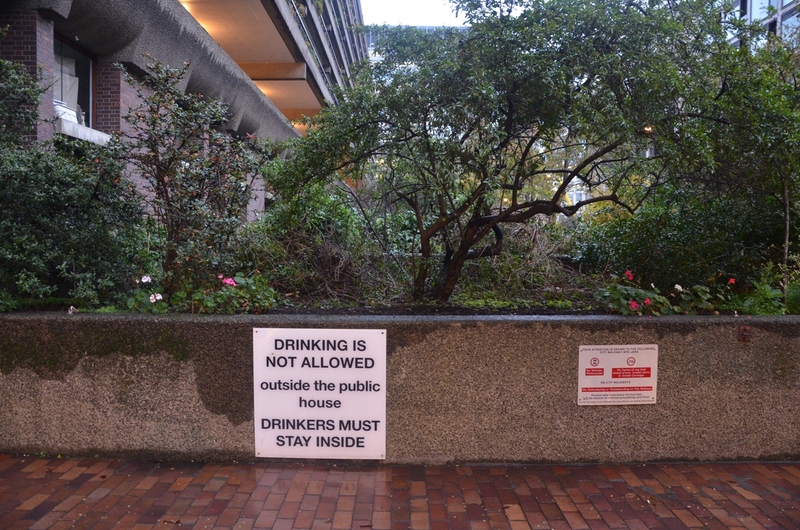 These pubs were “three new highwalk public houses” located in the Barbican development (which, at the time of Richards and Curl’s 1973 book wouldn’t be completely finished for another three years.) 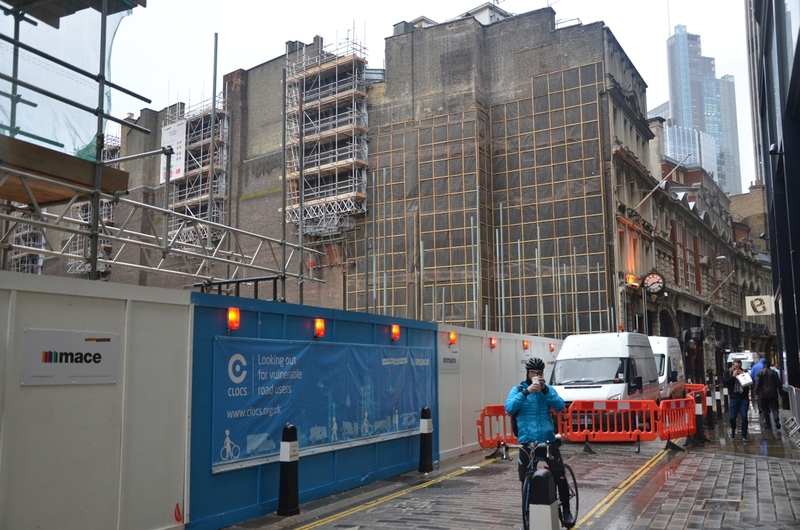 All were situated on the same Highwalk (the name given to the passageways in the complex which were high above street level), all appeared during the early 1970s, and all shut during the 2000s, ahead of a redevelopment of the fringe on which they were situated. Along with the pubs, St Alphage Highwalk has itself been terminated. 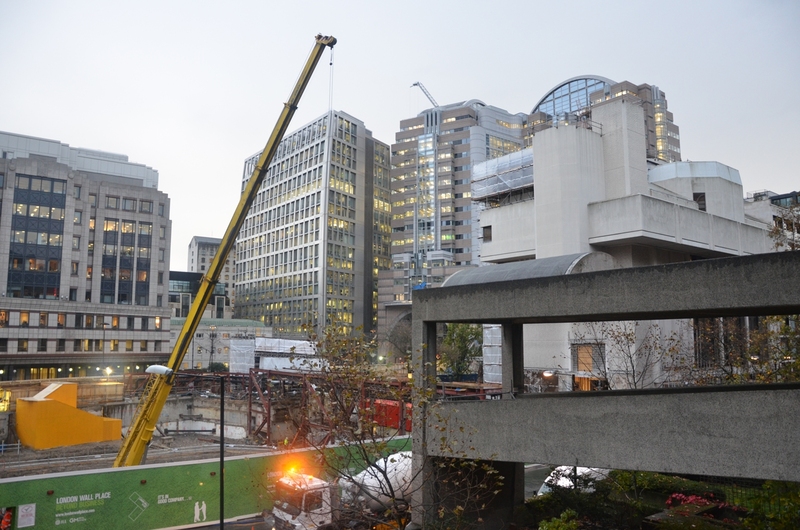 It currently leads nowhere, blocked off at one end and cut off at the other, as ‘London Wall Place’ (another office) is erected on the site where the pubs once stood, alongside a universally unloved late-1950s skyscraper named St Alphage House. 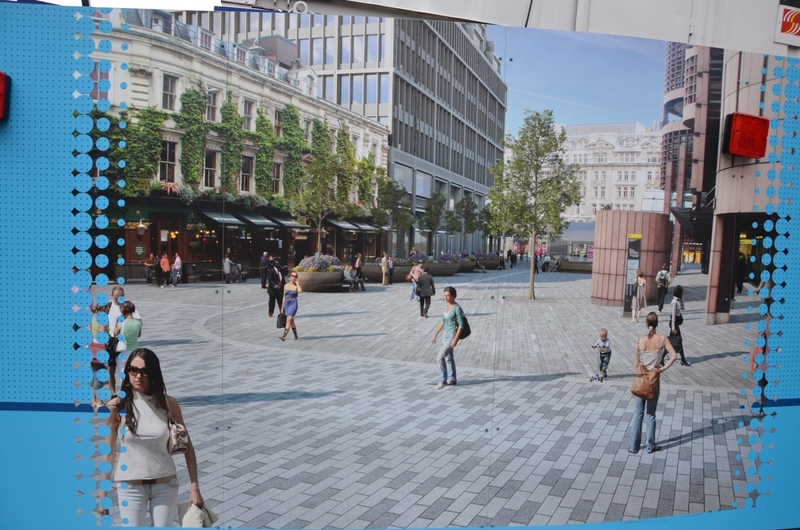 The small parade of shops on the site always underperformed and the units had been empty for a number of years. After the recession stalled a number of projects, the parade and St Alphage House were finally demolished earlier this year. 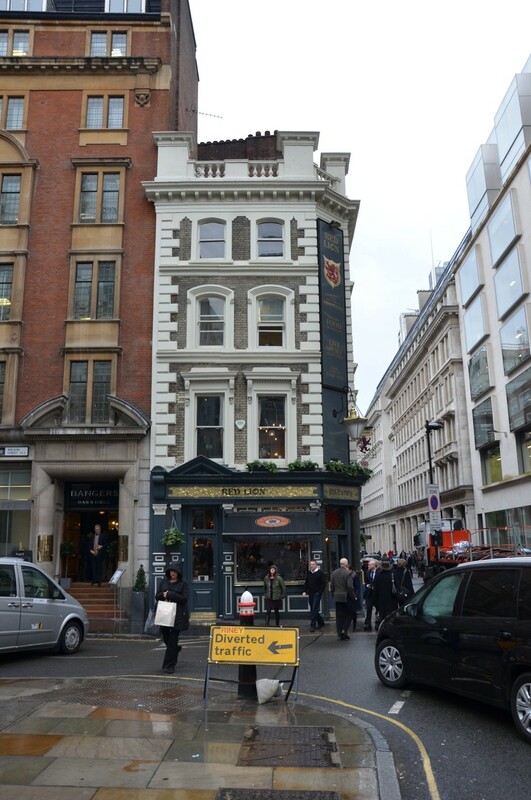 …while close by the Church is Wood Street, a restaurant which also serves drinks. It has a pub sign outside and a snooker table (although with red baize, which I have problems with), so I’m happy to count it as a pub. It was formerly known as the Crowders Well before its current incarnation. That’s what people who use pubs should always be. Not customers, not guests, not patrons. 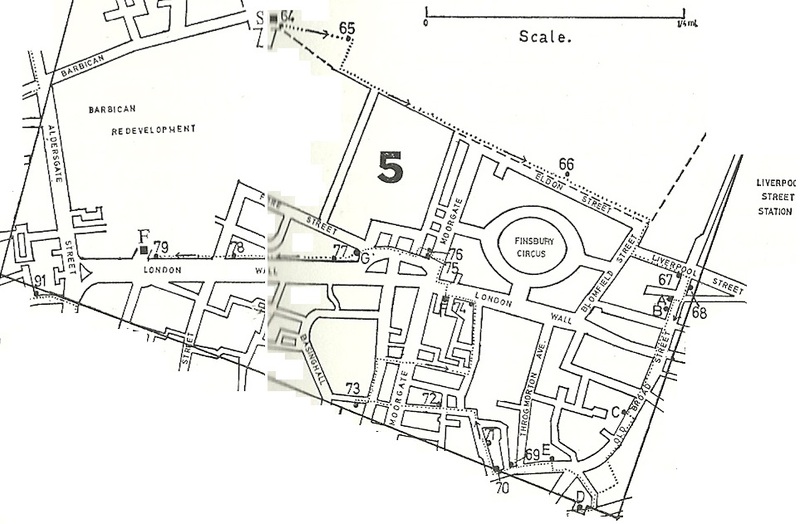 In this walk, Richards and Curl also included a number of wine bars (or as they had it, places that were “not a pub in the true sense of the word, but included as a drinking establishment”), which they chose to letter from A to F, rather than number like pubs. 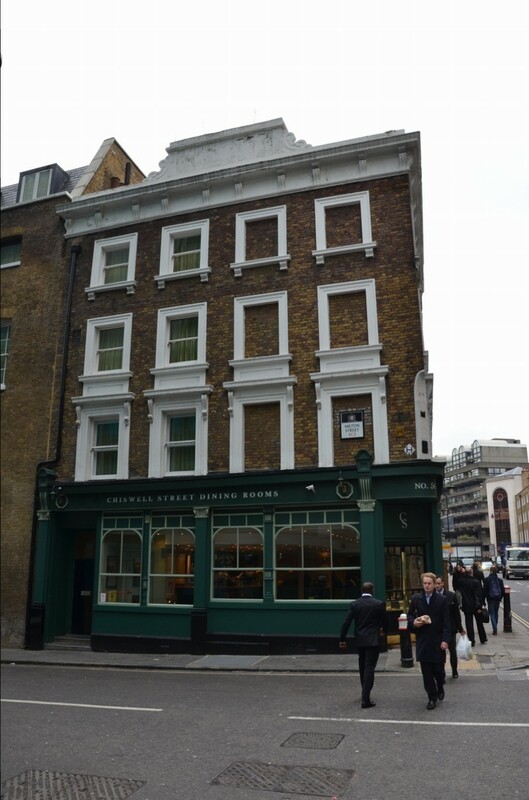 All but one of them – Gow’s Oyster Bar on Old Broad Street, which looked like a great place to go at Christmas and was fit to bursting with bald businessmen enjoying a late seafood lunch – have long gone, as, unlike pubs, when the owner left, the business didn’t continue. 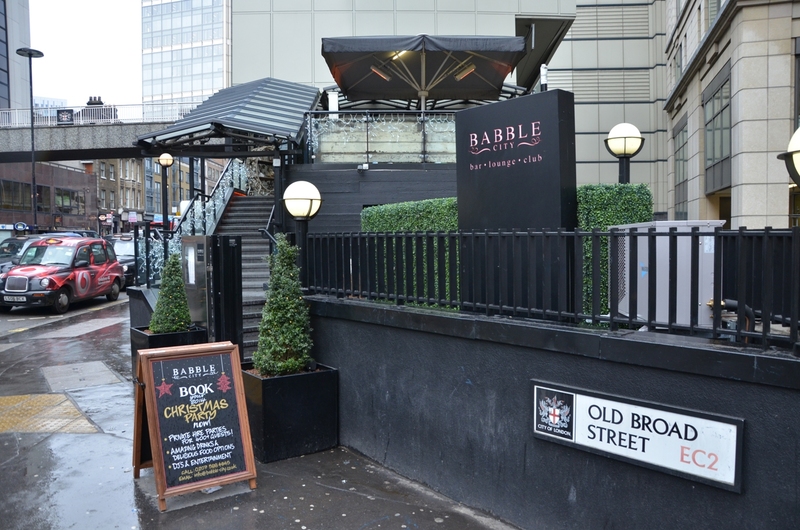 As such, I have left them off this survey, as I have done with new wine bar/club places, such as Babble City (which looks as if it was specifically designed to scare off anyone over 30) on Wormwood Street. 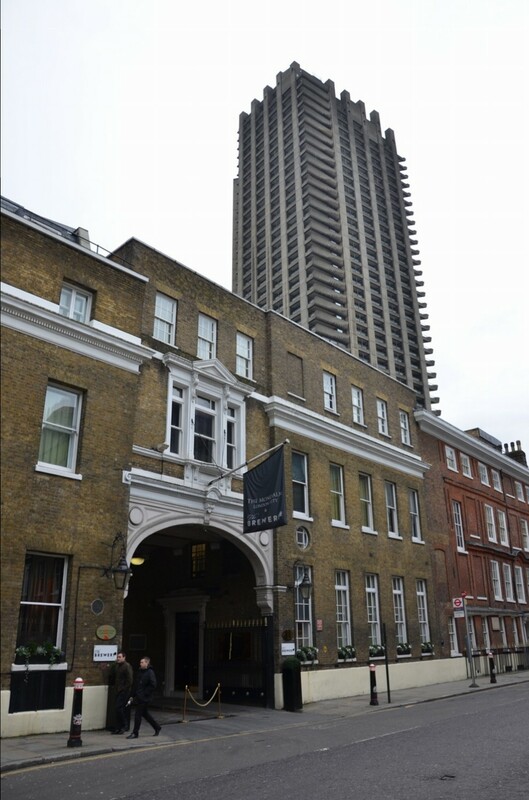 …and on Wormwood Street sits the King’s Arms, a Taylor Walker pub situated underneath a tower block which must have sprung up in the years following Richards and Curl’s book.